For many people, including those in wheelchairs and using crutches, lifts are essential for moving between multi-level buildings such as shopping centres and train stations. Pictured: A sign at Melbourne Central Station on a red and white tiled wall. The sign has directions to escalators for platforms 1 & 2, Elizabeth Street Exit, Swanston Street Exit and the lift exit. But lifts aren’t perfect either. Several factors including their size, their hours of operation and their location can render them just as inaccessible as escalators. Pictured: A raised ledge on the edge of the train platform to make the platform tall enough to reach the train doors. However a transport network where some stations are accessible and others aren’t, means passengers requiring lift access have to spend even longer planning their journeys, or avoid public transport altogether. Pictured: A tweet from the Public Transport Victoria Twitter account. The tweet reads: “There’ll be no lift access at #Parliament Station today between 9.30am and 2pm The nearest @metrotrains stations with lift access are Melbourne Central and Flinders Street. Get more info here if you’re unsure what to do: http://ow.ly/Uzmc30hLQui”. The tweet includes a photo of passengers walking towards escalators at Parliament Station. Overseas there have been changes to escalators to make them more accessible. Guide dogs were permitted on escalators in the London tube for the first time in 2011. And in Japan, some escalators have been adapted to accommodate wheelchairs. Josh Grisdale discussed his experience using these escalators during a 2015 episode of the BBC podcast Ouch. Hear about Amy’s experience using escalators and elevators in the fifth episode of People Movers. Listen via Omny, iTunes or your podcast app of choice (mine is Pocket Casts). The first and only time Amy tried to take an escalator, she tripped and she’s never taken an escalator again. This is episode 5 of People Movers about the accessibility of escalators. L: Like one in front and one behind? A: Generally, yeah. And I guess to give context to that – so I said crutches before, a little bit more in depth. I have cerebral palsy and that negatively impacts my balance so escalators are generally on a downward angle and when you kind of don’t have much of a sense of balance it’s not the best situation. But my Mum was like “come on, give it a go, you can do it” and she didn’t want to stand backwards either because she couldn’t see the lip down the bottom. So she was like “I’ll stand behind you, it’ll be fine” and I don’t remember much but I remember agreeing to get on and somehow it either slipped from under me or I lost my balance, I don’t know. But I can still picture it in my head little 8 or 9 year old me lying down and seeing the escalator (sic) ready to chew me up like it’s worse than any horror film in my mind. I just remember seeing the blades going in, out, in, out and so my Mum was at the bottom already and she’s like “c’mon, you can do it, try it by yourself, it’ll be fine” and it was straight down so there was really nothing except the rails on the side did move so they were annoying to grab I guess. I slipped about a quarter of the way down and I don’t know how I think I just lost my footing, I don’t know I think I was just freaking out. And she was already down the bottom. So I’m slipping and I’ve got long hair at this point and I just see the silver bit and the claws and I can still picture it in my brain and she’s freaking out trying to stay calm, she’s like “just stay calm, it’s okay, it’s okay”. And I remember all of a sudden hearing this smash of the emergency glass and then she pressed the button and there was this little siren and the escalator came to a stop and I was freaking out and a guy came around and was like “why’d you do that?” and then he sees me lying on the escalator and he kind of gives us a break which was nice of him. A: Yeah so she’s had to push the stop button twice. This was the second time. We were in an airport and when I’m in an airport we use the airport wheelchairs and it was overseas but we had an assistant helping us push the wheelchair so Mum could take the bags while we got to the taxi or wherever. And in the airports they have those ones for the business men with the luggage and whatever and the known rule, at least I thought, was do not take wheelchairs on escalators, even flat ones it doesn’t work. Anyway we get to where the escalators are in this airport and the lady says “oh it’s fine I’ll take the wheelchair and Amy on the escalator, it’ll be fine it’s flat” and my Mum and I kind of look at each other and go “are you sure you should be doing that” and she goes “yes it’s fine it’s fine” and we’re in a different country, we don’t know if they’re specialised wheelchairs to go on the escalators or if she’s done it before so we’re kind of like “okay”. And so she puts me on, she’s in the middle and my Mum’s behind. I didn’t see this happen but somehow the wheelchair blocked the line so the woman got stuck and couldn’t get me off the edge of the lip, like the wheelchair got full on stuck, so she was getting crushed into the wheelchair and then my Mum was behind almost slipping over her and my Mum claims she almost broke her leg. A: Yeah because I was being tipped out of the wheelchair, this woman was stuck in the middle and my Mum was like “my leg’s gonna break” so you had potentially three injuries in one. So yeah it was great that my Mum managed to get tunnel vision and identify where the button was. And yeah ever since then I’ve had an irrational fear of escalators. It’s no secret that so far this has been a fairly pro-escalator podcast. But what if you can’t use escalators, like Amy? How much of an impact can a technology have on you, if you can’t access it? I said in the first episode that I take the escalator at Melbourne Central twice a day, three times a week. But after living in Melbourne for six years, I’d never actually taken the lift before because I’d never needed to. There are two lifts at Melbourne Central station. They’re opposite one another at the Swanston Street entrance. They take passengers from the main concourse to platforms one and two and further down to platforms three and four. On the end of platform that’s closest to the lift, there is a raised ledge to bridge the gap between the edge of the platform and where the train doors open. 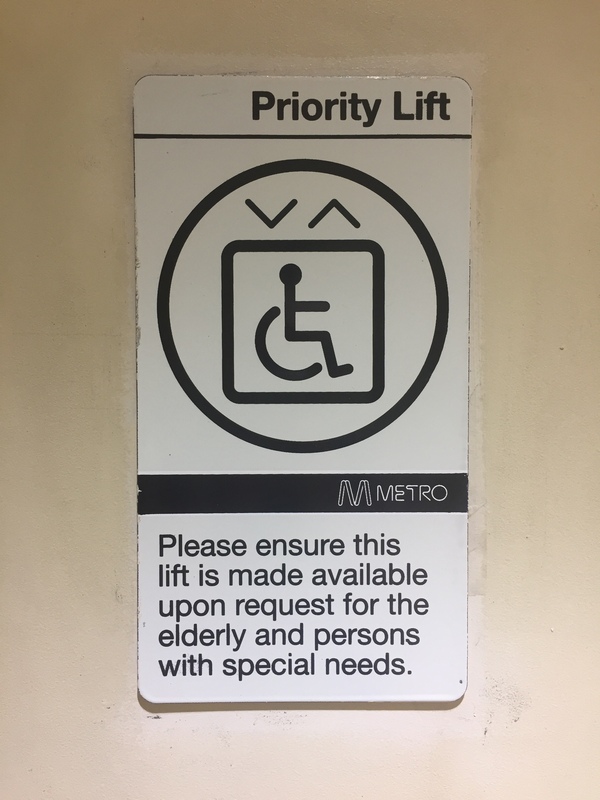 But although lifts are more accessible than escalators and there are structures in place to make sure that the journey from the train to the platform are accessible, they’re not always a one size fits all solution. And just because one station is accessible doesn’t necessarily mean that the whole network is. And what if the lifts aren’t working? L: Something else that I wanted to talk about was with recently over the last year or so there have been a lot of construction to City Loop train stations and I hear a lot on the train announcements being like “the lifts are closed at Parliament Station, if you need lift access, alight at Melbourne Central” or something like that. What kind of impact do those maintenance and disruption have to your day-to-day getting around? A: Because of how public transportation system is anyway, some stops are accessible and the tram or the train isn’t accessible or vice versa and then some people’s attitudes, I avoid public transport altogether. I used Uber, taxis. I find especially with the lift disruptions it’s too unreliable and when it’s what I solely rely on for my independence it’s too much of a risk. So if the lift’s out, I’m out. I’ve never been in a situation thank goodness that the lift’s out but if that happened I probably wouldn’t trust public transport for quite a while. And then you’ve got to factor in that for a lot of people with disabilities they need more time to change their plans, because you change one station and then you’ve gotta go “okay now I’ve got to get from a different station to my destination what’s the accessible route for that” so you’re not just throwing out one piece of the puzzle, you’re potentially throwing out the whole day. If that happened to me I would have to have to think about how do I get from the new station to where I want to go and how do I do that in an accessible manner. I think if I was caught in that situation, it would be very confronting and very tricky to deal with. It’s a lot more than lifts breaking down or even being unreliable, it’s more is the lift itself easy to access? And is it open, is it running, is it accessible the same amount of time as the escalators? A: It’s even the size of the lift. If you’re in a manual wheelchair they’re generally quite small or I’m on crutches so I can fit in small lifts, but if someone’s in a scooter or an electric chair they’re larger and my friends have had experiences where they can’t fit so they’re not accessible to everyone. It’s infuriating because as you say a lot of people go “oh it’s a quick fix we have a lift” and again taking it out of the public transport system sorry, but sometimes the lift is like around the back and up the alleyway and past the dumpster and it’s also like well how does that make the person with the disability feel as well. There’s only so many times you can be like “oh I’ve gotta go around the dumpster while you guys get to go to the nice entrance”. So it’s not just looking necessarily at the practicalities of it, but it’s also going, in my opinion at least when looking at that sort of thing going “would I feel equal to everybody else in taking this entrance and doing it this way”. And can I also fit anyone who might need to use this? L: So my final question was going to be a little bit of a silly one because I like to be as silly as possible, within reason, in the podcast. So obviously escalators and elevators are not going to live forever. We’re gonna come up with solutions that supersede both of them. I was wondering, in your professional opinion, in a fight to the death or to extinction, between elevators and escalators who do you think would be victorious and why? What do you think will live longer? A: What will live longer? Well okay when you said fight to the death I just pictured, what do you call it when an inanimate object comes to life? A: I just pictured an elevator and a lift.. And elevator and a lift? An escalator and a lift going at it with each other. In that case I’d say the escalator because it’s got the teethy claws that I’m afraid of. A: True you could get trapped! But I feel like the escalator has the handlebars to kind of deflect that. But in terms of technology and which one’s gonna last longer, I am going to give you a serious answer sorry. Lifts just because in the case of Australia our population is ageing and there’s going to be more people who need more access to lifts. A: You’re welcome. But yeah I think lift’s are gonna win which makes me very, very happy. L: We’ll see. Thanks so much for your time Amy, I really appreciate it. Before we go is there anything else that you wanted to add?